What some have billed as the world’s largest solar project in the Mojave came under fire again today. This time a baby desert tortoise led the charge with a cohort of environmentalists. 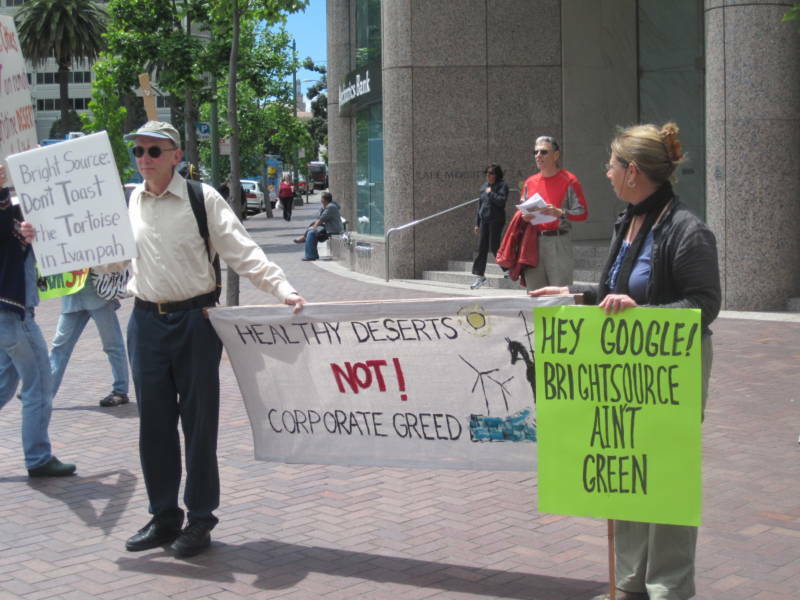 While the tortoise provided a slow-motion picket around downtown Oakland, protestors lined up in front of BrightSource Energy’s corporate headquarters, determined to preserve the Mojave desert and keep solar projects local. At risk of habitat loss from the project, the tortoise is becoming the iconic image for preservation of the Mojave. The Bureau of Land Management put the brakes on two-thirds of the Ivanpah solar farm when field biologists found more tortoises than initially expected. Tortoises found on site are being relocated and fenced off, preventing their gradual return. Two segments of the Ivanpah solar farm are on hold until the federal Fish and Wildlife Service issues a plan for relocating the tortoises. Despite the controversy, BrightSource maintains that the project will finish on schedule in 2013. There is a better way to tap into the sun’s energy. It is called “distributed solar”. Solar on rooftops, solar over parking lots, solar along existing corridors and disturbed land. Not only does the Ivanpah project destroy a beautiful desert (which is prime desert tortoise habitat), but there is an additional need to transmit that energy over long distances to where it is needed. The first thing we should have been doing is puting solar energy to work where it is needed. Where is the money to do that? there is money for distributed solar. It was initially called the Million Solar Roofs initiative (thank former Gov. S) and now it is being handled by California’s large utilities via the California Solar Initiative. http://www.gosolarcalifornia.ca.gov/about/csi.php. For example, though unfortunately I can’t find a link at the moment, I believe SCE has a program to put solar photovoltaics on the miles of warehouse space in its service territory. A problem is that the utilities won’t get credit for these renewable purchases because presently renewable generation hooked up at the distribution level (as opposed to the transmission level like large scale projects) doesn’t count toward the utilities’ renewable purchase quotas. Point is, distributed renewable generation is happening and there is money for it. In my view the energy community (utilities, developers, regulators) is trying all generation technologies, including utility scale solar in the desert, because meeting the 20% goal (and now the 33% goal) requires all kinds of projects. If the royal We want significantly more renewable generation, large-scale renewable generation projects are part of that mix. In my view we can’t have it both ways. whoever brought the desert tortoise should be thrown in jail because they violated the endangered species act. 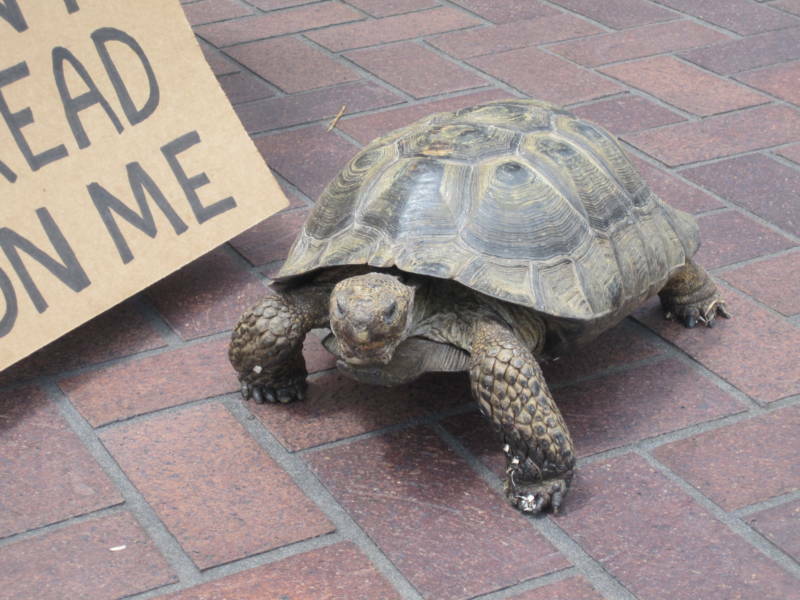 It’s legal to own tortoises, as long as you follow the rules set down by the state and the feds. So you’ll have to come up with some other inane reason to dismiss the demonstration, Hal. Many millions of species other than just tortoises (humans being one of them) will be in a world of hurt If we do not build out ALL kinds and scales of renewable energies as quickly and aggressively as possible. Local and utility-scale solar should not be an either/or question; it MUST be a both/and proposition. Both scales need to be done smartly and with some thought to the most appropriate versus sensitive areas, but demonstrations like this run the risk of painting utility-scale projects as never worthy of support–which would be a terrible, terrible mistake. The reason they had the protest is because all the policy makers and wonks were in such a hurry to rush these desert solar projects into service with short cutted regulatory oversight and “environmental reviews.” When the CEC was provided information which should have caused them to cancel some, they claimed overriding concerns to put them into service anyway- supposedly due to climate change or to comply with AB 32 but some suspect mainly to get the federal money before the time limit to start building, was up. As far as “but demonstrations like this run the risk of painting utility-scale projects as never worthy of support-which would be a terrible,terrible mistake”- I think it would be a bigger mistake to allow these projects to go through without protest,considering the damage done to the ecosystem and its’ denizens which will not be erased in a hundred plus generations. Yes, by all means, rooftop solar and large scale power generation upon brown or degraded lands closer in, of which the EPA and nonprofits have identified hundreds of sites. companies– local power for local people, local jobs in renewable energy for local workers– and when you have time, go to the last remaining unspoiled wilderness and reconnect with nature- before it is too late. Hey morongobill, with ya 100%. On another note about being screwed by policy makers: Anybody notice the slight of hand trick known as the DRECP? That’s Desert Renewable Energy Conservation Plan. In short, it is a fast track system to permitting industrial sized renewable energy facilities in the desert and a conservation plan all rolled into one. Or should I say a white wash on the destruction which is about to be fast tracked into our desert. It’s a simple concept, give the enviro groups involved in the DRECP a reason to buy into the massive solar facilities and resulting destruction by granting them a conservation plan for almost essentially all of the desert regions of southern California. The plan area is some 22 million acres in size. If they feel compelled to save something, why don’t they save the hundreds of square miles of desert habitat and natural communities from this so called “plan” for conservation and renewable energy. They have sold their souls, and sold out OUR desert by allowing this inevitable massive destruction, under the illusion of doing something “good”, for whatever happens to be left over. Take a good hard look at this plan, this citizen is looking, and is disgusted with every new page of “plan” they create. It’s not thoughtful conservation, it’s not a worthy balance between human needs and our environment. Once the solar panels are up, and there is crawl space beneath, these shaded areas on the desert will actually flourish. Small mammals, lizards and turtles will congregate beneath the solar panels and larger wolves and coyotes will not be able to get to these animals. Instead of anger against these solar panels maybe a re-evaluation of what do these panels do to provide decrease heat by none exposure to direct sun light, With a gap between each panel, walking area for humans to check on the panels plants can grow. Who is the environmental expert that “knows” for sure that this solar plant will harm small animals at all. There seems to a lot of unsupported scientific BS from both sides. Put up a small square mile section of panels, and see what really happens. For now nobody knows for certain. Just emotional BS. These large solar projects are the only hope of eclipsing coal in the current newborns life time. The logistics and costs of roof top PV, even at double the current efficiencies, cannot compare to large scale Concentrated Solar Power(CSP) over the next 90 years. The implementation of PV on 350 million roofs vs 2000 CSP plants like Ivanpah would cost much more and take much longer. In which time coal, nukes and oil would continue to expand to the point where future generations could not catch up with the only sustainable power that Solar offers. True concern and mitigation for desert life is needed as the first 10 or so plants are built so as to ascertain proper knowledge on how to proceed ecologically and economically with the rest. The best mitigations can only be determined by completing a few of these plants. Not doing so only dooms many other species elsewhere at a far greater cost not just dollars and cents. I just love that no where in these comments (thus far) or in the articles regarding BrightSource plans is there any mention of *conservation*: the fastest, cheapest, most distributed method of reducing energy consumption *now*. People can debate whether sacrifice areas of desert solar development are better for the country that removing yet another mountaintop, or strip-mining tar sands for coal, or erecting bird-slaying, noisemaking wind turbines, and that debate should continue. But it is just astounding that the ferverent write so little about how they (we?) are reducing use of: transportation, residential energy, transported goods, and food-from-far-way. I am not holding up my lifestyle as the ultimate example, but as one who has consumed less than $18/mo in *total* residential energy use (all of it utility-delivered electric) over the last 15 years, I know a thing or two about how to do it. Easily. Without huge sacrifices, or discomfort. Conservation doesn’t require rocket science, folks. 70% of the world’s people do it (most of them by necessity). While Americans squabble about how to destroy the earth a bit less quickly, using their wasteful, habitual over-consumption.